A couple months ago, I was looking to expand my horizons and find some new places to explore. I decided to do so through work. After searching out some new venues to share my organizing skills with others, I went to an orientation meeting for volunteers at New Moms, Inc. in the city's west side. 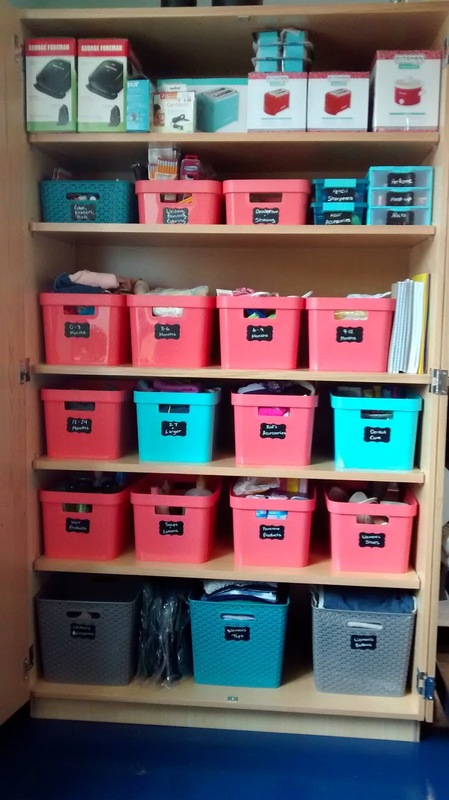 Though I was going in the hopes of speaking to group participants at some point, the staff lit up a bit when I mentioned that I was a Certified Professional Organizer®. About a week or so after the meeting, a staff member reached out to me asking if I would be interested in helping to organize some areas of their facility. Of course! New Moms, Inc. is an organization that offers housing, jobs training, emotional support and much more for young and teenage mothers and their children who are usually without a place to live. 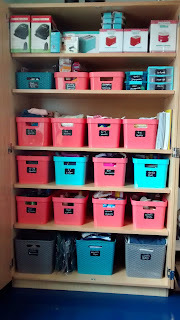 Though I personally can only imagine what it would have been like to have children when I was a teen, I feel confident that having some sense of organization in my life would only be the iceberg of what I would need. Nevertheless, it would make some parts of life that much easier. 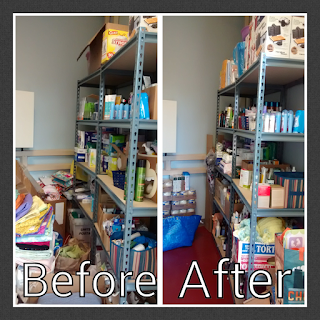 I then tackled a basement storage area that housed shelves and shelves of overflow diapers, formula, clothes for moms and babies, toys and seasonal items. 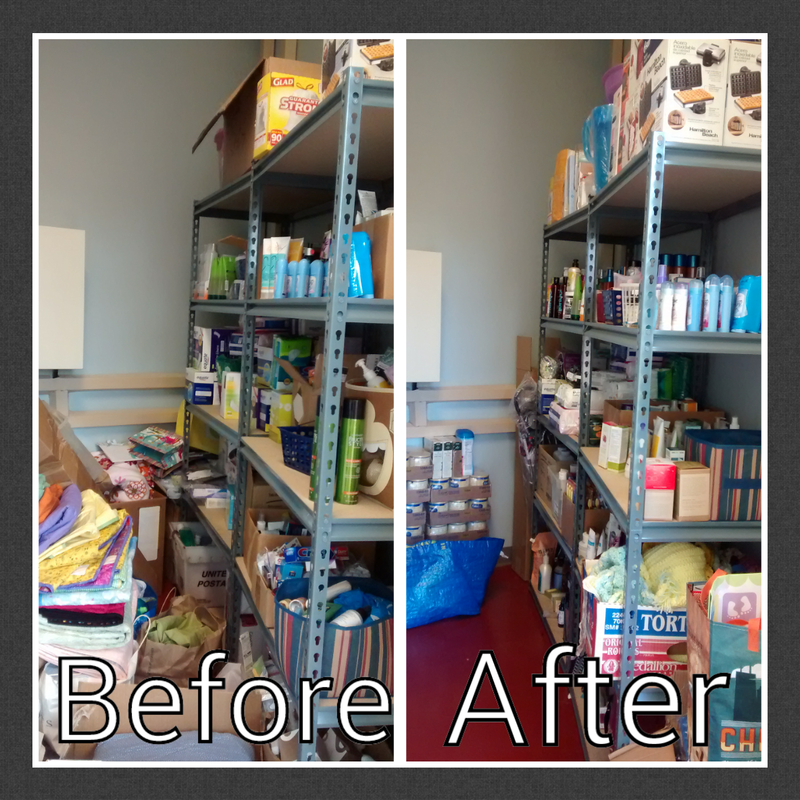 Again, a system had been in place at some point, but the amount of items had outgrown it's space (great for the organization!). Yesterday, I finished with an area referred to as The Boutique. This is where moms go to shop for items they are in need of. Beauty products, clothes, school supplies, books, toys, diapers and so on. The facility had received a grant for some new furniture, so we were able to start from scratch with new cabinets, bins and chalkboard labels (my first time using them!). It turned out pretty great. All in all, it was pretty great to know that instead of helping an individual or single family have an easier, more peaceful life in their space, I was able to help facilitate an entire group of women and their families feel a little more like themselves, a little more comfortable and a little less lost.